Even PAP Vote Share reduces to 55%, the Oppositions could still hold 7 seats. Even if the oppositions is managed to gain 45% of the total votes in GE2015, it does not mean a big win. Instead it can still be a big loss, a big disappointment. If you present it in a spreadsheet, even the Workers’ Party improves its vote share to 51% (i.e. WP 51%, PAP 49% in all WP contested seats), there is still no breakthrough for WP. What a big disappointment! You can even treat the spreadsheet as a political game that you can adjust the percentages for each constituency that opposition parties will obtain. If you think Party A should get more votes, you just increase the percentage and see the overall result. You can also predict the PAP will win 60% of the total votes and WP will lose more seats. Alternatively, you are very confident of a big win for the oppositions, you can adjust the spreadsheet accordingly. But be realistic! This spreadsheet of GE2015 prediction is very a low tech tool if you consider the state machinery of the PAP. Over the past 50 years, the PAP has invested many resources, hardware and software, in predicting the outcome. With the advancement of technology, this becomes more sophisticated and comprehensive. They can even predict the outcome when you visit their sites or download their apps. PAP has supercomputer and big data analysis experts. Every results of every polling districts of GE2011 and PE2011 can be easily input into the computer. Computer modelling can predict the outcome for different issues, change of policy, mood change, feedback etc. SG50, National Day Parade and Rally, Medishield, Pioneer package, Baby bonus, all have already input into the computer. And many more advices from their foreign and local consultants. The PAP is doing the analysis every day or even every hour, from subject to subject or constituency to constituency. For example, the AHPETC issue, when Ministry of National Development issues a statement, what is the response in the ground, in particular inside and outside Aljunied, Hougang and Punggol East. It may have little impact inside and big impact outside. Little inside impact means WP can keep the 7 seats but WP is not able to win any seat outside AHPE as there is a big impact outside. When the nomination is closed, new issues will appear. In Ang Mo Kio GRC, national issues, like CPF, population, human rights will be raised. The PAP may have to shift their focus from the regional issue of AHPETC to jobs, CPF, Singapore Core, citizen engagement etc. This is a national election, the PAP will have to discuss and defend their national policies. Of course, the PAP can also ignore national issues as they see WP is their only threat. WP is the only party that can match the PAP challenges and obtain 50% or more votes in WP contested constituencies. So, if you can put down WP, even with a small win in other non-WP contested constituencies, the PAP will win big in GE2015. This is why Dr Ng Eng Hen is so confident that when he talks about ‘ALL 89 seats’ win in this election. 89 may not be realistic but 89-7 is possible. This is the PAP’s target. For opposition supporters, if we don’t like to receive a big disappointment, we need to put in more efforts, convincing more voters to vote for change. However, let relax and do some exercises, play the spreadsheet game before our long march to deny PAP two-thirds majority in the 13th Parliament. Here are 3 selected TCM physical exercises for the preparation to empower your future. (You may not understand Mandarin but the exercises are self-explanatory). PAP is crying for “With You, For You, For Singapore”, do you understand why? The People’s Action Party practiced crying 50 years ago. It just continues to do so even many Singaporeans, especially young voters who are born after 1965, do not know the real reason of the 1965 crying. Crying seems to be a habit whenever the PAP faces a crisis. No wonder we see so many PAP members of parliament and ministers are crying these days. 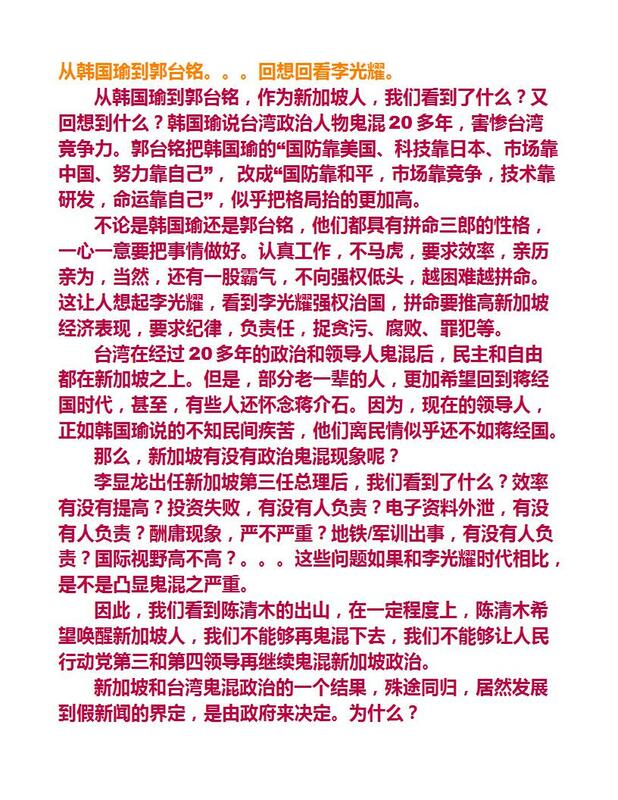 From Lim Boon Heng (again), Ong Teng Koon, Lee Bee Wah, Lim Swee Say to even Lee Hsien Loong, more and more are crying. Even DPM Tharman got emotional yesterday when he announced the PAP Aljunied GRC team. Do you know what are they crying for? Perhaps, like Dr Toh Chin Chye, there is no answer and no reason for crying. One possible answer can be like 1965, the PAP is facing an uncertainty. There was a crisis and they were worried. They need voters’ support and the support of Singaporeans. “With you, for you and for Singapore”? 1965’s Singapore and 2015’s Singapore is very different. Singapore core was nearly 100% then. Today, the PAP is saying they are trying to maintain two-thirds Singapore core. The PAP is not sure whether they can maintain this level of Singapore core. Do you understand the ‘You’? Does ‘You’ refers to Singapore core? Or a future Singapore without the Singapore core? I don’t know the meaning of ‘With you, for you, for Singapore’ . Singapore First seems to have a better solution. ‘Restore Our Nation’ is their 2015 election slogan. It means restoring the Singapore core. Without the Singapore core, Singapore will lose our fighting spirit. Credit should go to Lee Kuan Yew as he managed to turn against the odds. But 2015 is not 1965. The PAP is talking about their fourth generation. However, they are very different from the first generation PAP. 'You' has different meaning in 1965 and 2015. Today, the ‘You’ to the PAP is a tourist and Singapore is just a hotel. ‘With you’ can mean providing opportunity to you, it may not be the Singapore core. ‘For you’ means Singapore enriches you, again may not be the Singapore core. ‘For Singapore’ is the PAP’s standard answer: foreigners create jobs for local, for Singapore. The PAP sees the crisis ahead and so they cry, one after another. They have a different meaning of ‘You’. The worst part is the PAP does not want to empower you. They want to be with you and perhaps work hard for you. But certainly, they will not give your the power to decide your future. They want to practice the same 1965 crying strategy: with you, for you, but no rights, no power, no freedom. 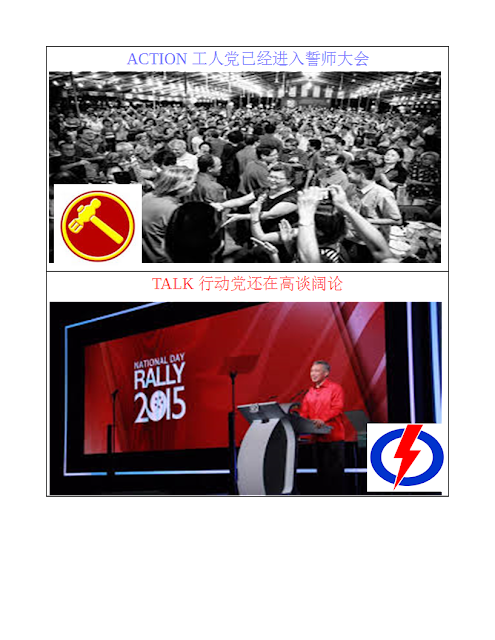 Do you trust a PAP slogan crying for a return of 1965? If you vote the PAP, it is again the return of the dark days of economic growth without a caring heart, without democracy. Just look at the media, it has failed its duty again for another negative reporting. You cannot expect the mainstream media to protect your civic rights under the PAP. Empower your future and restore our nation fighting spirit are the keys to Singapore future in this coming election. If citizens have no rights, no powers for freedom and no demand for transparency and checks and balances, then it is a back to the past, not creating the future. The PAP says voters are voting for SG100 and their 4th generation PAP leaders. But they never give the promise to ‘empower your future’. They only want your mandate to empower themselves to restrict your movements, actions, thinking and civic rights. It is the same old crying strategy, past, present and future if voters continue to support the PAP. If you read the Chinese media, you will notice how superstitious the PAP can be. We are talking about empower our future. Do you trust the PAP for your future? - A party that can only promise its delivery based on superstition and luck. GE2015 is the time we seek an alternative to empower ourselves rather than enriching the PAP. A strong mandate to the PAP will paint a wrong future for Singapore. And most importantly, it is against the 'feng shui' turning. It is good to launch a campaign and the fate is already fitted on this day. The rumor of possible walkover is always a possibility. In the last few days of Chinese 7th month, there are only one good day(吉日). It is September, 11.
date instead of September 12. You may think this is a just a coincidence but Chinese do believe this and in fact, in Chinese traditions, it is important to start a business or even launch a war in a lucky day. It is a ‘feng shui’. Since the Chinese mainstream media is covering it, they are reporting it from the viewpoint of the PAP. It means September 1 and 11 are good and lucky days for the PAP. However, it can also be a good and lucky days for the oppositions, especially one believes the ‘feng shui’ is turning against the PAP. In Chinese, it is called ‘风水轮流转‘. ‘Feng Shui’ is not a constant and it will change, just like the yin and yang. Fate can be changed and unlucky fate can be avoided by doing good things. 'Feng shui' masters always advise believers to do good things, charitable works etc. The PAP strongly believes they can change their luck by doing things like SG50, pioneer packages, baby bonus, housing grants, MediShield Life, etc. So, they should receive the mandate of the haven. And Goh Chok Tong wants a strong mandate. Then, the haven will ask him what Goh and the PAP have done so far. Are there beneficial to the people? Is that so simple? The PAP is also doing bad things in the past and present too, for example, ISA, bankruptcy, family planning, population, high cost of living, rich-poor gap, low-income sufferings, etc. To cover the bad doings and prevent the bad luck, ‘feng shui’ has to come to rescue and change the bad luck against them. Choosing a good date for nomination and polling days is a 'must' for good 'feng shui'. The changing ‘feng shui’ is the normal thing and it is also the certain thing. In GE2011, many consider it is a breakthrough and Singapore politics is moving towards a new normal. For 50 years, the PAP managed to keep its authoritarian power unchallenged. It is in fact not a normal thing and hence creates uncertainty. 50 years without change is against the normal flow of 'feng shui'. A strong alternative force in parliament is a normal development with certainty. The PAP is trying all means to prevent and avoid the the ‘feng shui’ turning. There is a price to pay for doing things against the ‘feng shui’ flowing. For example, locals will have to suffer, low income workers continue to have no wage increase, infrastructure cannot cope with the population increase, PMET jobs etc. The PAP also knows about this. As a short-term solution, they are using new notes, new LKY memory services, National Day Celebration and Rally to boost their image and luck. They even move one of the nomination centres to Raffles Institution. They hope these can prevent the turning of ‘feng shui’. The PAP had done well and good in the past. At the same time, it had also committed some mistakes. LKY managed to prevent the turning of ‘feng shui’ by his iron hands. However, iron hands are not allowed in today’s Singapore. Lee Hsien Loong is the third generation of the PAP. In Chinese, luck cannot last longer than three generations. (富不过三代）. It is a wonder if he can get a strong mandate by preventing the ‘feng shui’ changing. A strong mandate is gained through caring, kind and compassion. The PAP’s Amazon way of treating Singaporeans is against the yin-yang balance and the ‘feng shui’. Chok Tong is a liability, not an asset. Plus the Aljunied Effect in Marine Parade. The PAP is throwing away free lunches like nobody money in election time. They not only provide free lunches. In addition, they also give more financial incentives, for example, HDB grants of $20,000, or even up to $80,000 if residents are qualified. For young children, they also increase the baby bonuses. This is one of the free lunch events where you see potential PAP candidates serving lunch to residents. The PAP wants to talk about minds and hearts in this election. They strongly think free lunches and goodies can catch the minds and hearts of voters. They have been doing it non-stop in the past 50 years. However, with the maturity of voters, the strategy of free lunch faces a dilemma that generates diminishing return. The more the PAP invests in free lunch activities, the less return they receive. As a result, minds and hearts are no more with the PAP. In the opposite side, the PAP is wondering why people are willing to pay money to attend Workers’ Party SG50 celebration dinner. The Straits Times reported one hawker was paying $45 to attend the dinner. Use your ‘minds and hearts’ to think about this. A not so well to do hawker is willing to spend money for a dinner with WP and not a free lunch with the PAP. What does this imply? This is the paid dinner organised by WP last Sunday. Free lunch vs. paid dinner. And people choose to pay for the dinner and receive a proper dignity and respect. This is very unusual for a ‘money no enough’ Singapore. But people are awakening and demand more respect. Look at the right hand side of the above picture, the explosive growth of Amazon is what the PAP aims for. Now, we can better understand why low-income workers have no wage increase and the PMETs could not find a good job. The PAP is treating Singaporeans like Amazon treats their workers. The government is only interested to make money, to be faster, better and cheaper. This explains why the minds and hearts are not at their side. And the PAP still wonders why a paid dinner has a higher value than a free lunch. To put in a simple analogy, it is the difference between action and talk. Logo no enough? Money no enough?